Caldoun Abuhakel and his 12-year-old son, Baraa, traveled from their Minnesota home to Washington, D.C., to meet with members of Congress and key staffers. Some 300 Muslim-Americans from across the United States gathered Monday on Capitol Hill to talk with their representatives about Muslim-American issues. Baraa told VOA that he has experienced taunting at school, when other kids told him to "stop being so Muslim, stop being so terrorist." But he says his younger brother, Muhamad, is frightened and upset by the anti-Muslim rhetoric coming from Republican presidential candidates Donald Trump and Ted Cruz. The boys' father said that after watching campaign coverage on television, seven-year-old Muhamad asked if the family would have to move if Trump or Cruz were elected. On Monday, Baraa looked for answers for his brother. The U.S. Council of Muslim Organizations (USCMO) organized Monday’s second Muslim Advocacy Day. First, the delegates received training on how to make the best use of their time — about 15 minutes — with each lawmaker or staff member. Then, the group split up into smaller state delegations and fanned out to meet with their representatives. The first stop for the Minnesota group was Samantha Cyrulnik-Dercher, senior staffer for Democratic Representative Tim Walz. Cyrulnik-Dercher expressed her concern about the anti-Muslim rhetoric presented by some Republican candidates, but assured Baraa that she and others would fight any proposals banning Muslims from entering the U.S.
All the delegations raised the issue of increasing Islamophobia, especially in the wake of the Paris and San Bernardino attacks. They asked each representative to support two current resolutions that recognize and condemn Islamophobia. So far, 150 members of Congress — all Democrats — support the resolutions. One goal for Monday’s advocacy day was to win over support from some Republicans. The Minnesota delegation met with a member of Republican Representative Erik Paulsen’s staff, and was told Paulsen would look into the resolutions. The delegations also asked lawmakers to help Muslim-Americans and other minorities with bread-and-butter issues, including the Credit Access and Inclusion Act that would help minorities establish strong credit to purchase cars and homes. The delegations also asked for support of the Food Deserts Act — legislation intended to promote the opening of grocery stores in poorer communities that only have convenience stores and fast-food restaurants. In addition, visitors shared their concerns about the Obama administration’s efforts to counter violent extremism, saying they feel the Muslim-American community has been singled out for intelligence gathering activities and other potentially abusive law enforcement practices. The administration says Muslim-Americans are key allies in the effort to thwart terrorist attacks. 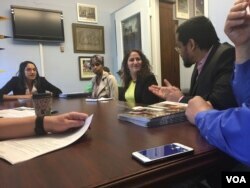 Whether or not their legislative goals were reached, members of the Muslim group from Minnesota stressed the success of their visit in strengthening relationships between Congress and the Muslim-American community.